The illegal cargo was discovered after officers at the Ugandan tax authority (URA) scanned three 20-foot (six-metre) containers carrying timber logs which had crossed the border from South Sudan. After growing suspicious, a team secretly tailed the cargo to a warehouse in Kampala and made the bust. "Logs were hollowed out and filled with ivory and pangolin scales then resealed with tons of melted wax to disguise the contraband," URA spokesman Vincent Seruma told AFP. "In a single container there were more than 700 pieces of ivory and more than 200 pangolin scales but we expect to recover thousands of scales," he added. Seruma said the traffickers were part of a "very dangerous racket" which takes advantage of conflicts in eastern and central Africa to poach endangered species. "These huge consignments often come from DRC or Central African Republic taking advantage of the lawlessness there. The level of smuggling through Uganda is high," Seruma said. "We believe they planned to bribe their way to their final destination so we are investigating the shipping agent and other contractors," the agency said. 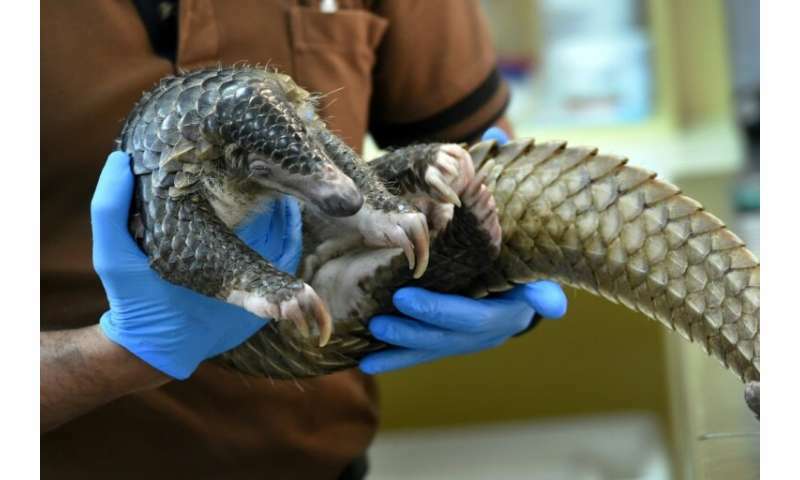 The little-known pangolin is the world's most trafficked and poached mammal because of the demand for its meat and scales.